This feels far more like a trick for Toronto than a treat; and given the scale of the commitment and rather blighting potential impacts if something goes awry or projections unfulfilled, the incredible haste to vote in favour of billions of spending with hardly the time to read the report etc. makes it an even more suspect vote/situation. It comes to either being in favour of transit or not being in favour of transit, (or it could be portrayed as that by some), and to be worried about implications is to be not in favour of transit. Surely better governance mandates having a decent time to read things, as well as getting other reports – like the Revenue Tools and a Suspect Subway Extension report – voted on first, instead of getting a bit pregnant with the Mayor’s fave projects that may do far more for the 905 suburban voters than Toronto ones. We already have a set of issues with mathemagics more than planning in Scarborough; we don’t need to beggar ourselves and prioritize some ideas more than other plans do we? I’m glad Steve is able to write dispassionately about details, but it’s sure feeling like the disaster of buy-election schemings in transit just keeps on giving…. and the train wreck is unstoppable with the essentially same majority that backed Ford apparently all OK to support Mr. Tory and his transit agenda. I hate to be so negative, because use of the rail lines from Bloor to Union to Danforth could be a help for a surface “relief”, but that’s not what’s arising. Steve, Toronto would be worse off without your objective blogging. I can see this going sideways very quickly. John John is clinging to fading hope that his pet project will get off the ground. What he fails to realize is that while you can pay for pretty much anything if you authorize it, you still have to find a way to pay back the money. Talk is cheap but if you do not have money coming in you can be screwed really quick. 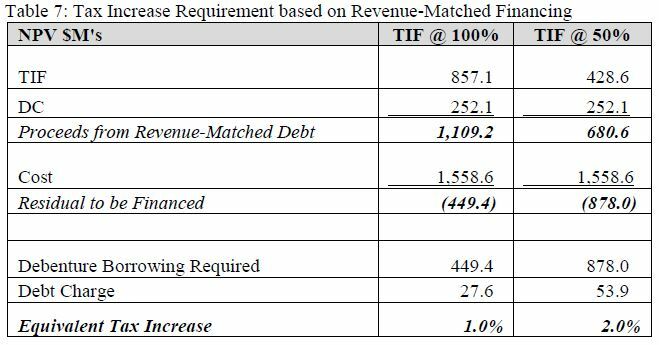 TIF is no guarantee money will be made to pay for all this. When you start talking billions things have the potential to go awry very quickly. While there is likely to be development in the area of SmartTrack I doubt it will be enough to pay for this. We need to make sure this is paid for, not hope the development is sufficient to pay for it otherwise it will bankrupt the city. Personally, I think SmartTrack needs to go. It is clear as day what is going on here. This will all end badly, the city will be on the hook and when it is all said and done it will be up to the next council to pick up the pieces after John flees to prevent himself from being accountable. The alternative would be much worse. If RER/SmartTrack were reduced to actual funds available, Toronto will face gridlock never before seen by 2027. 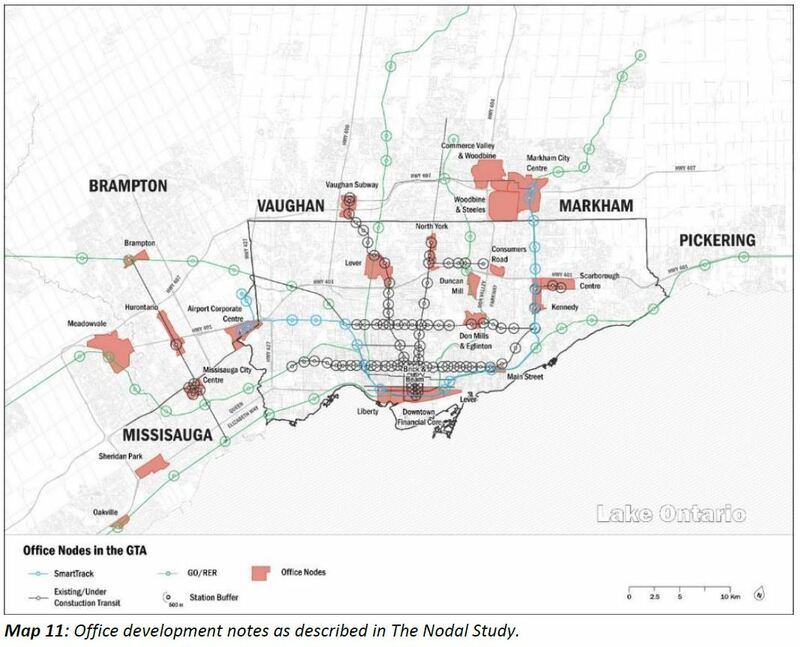 There simply aren’t enough roads to handle the rapid increase in GTA population. There won’t be any substantial increase in highway capacity, in fact the Gardiner ‘solution’ may actually decrease space for cars. So, if you enjoy sitting in traffic every day, for several hours each way, continue to vote for any GTA candidate who sees no need for new funding sources for transit. I’m surprised that there isn’t more of a backlash from the people living near Lawrence East & Ellesmere SRT stations. I know that I’m stating the obvious, but those near Ellesmere will now be facing a longer commute time (and there are new townhouses built near line 3 because of the proximity to rapid transit). And those living near Lawrence East now either face increased travel times or additional costs for hopping on the GO. I haven’t heard their city councilors share any concerns about their inconvenienced constituents. I do not understand the concept of “uplift”. I thought that property taxes were rebalanced each year so that the total works out the same regardless of the assessment. If every property went up 15% equally – the mil rate would be adjusted downwards accordingly. If some properties go up 20%and others only 10% and the average increase is 15% – then the 20 properties pay more tax and the 10% properties less and the total remains the same. Properties move up or down for all kinds of reasons as neighbourhoods move in and out of fashionability. How does one distinguish “uplift” as a result of a TIF Financed development from a normal increase based on increased demand in the marketplace. Steve: That’s another reason staff do not see “uplift” as a worthwhile part of TIF. 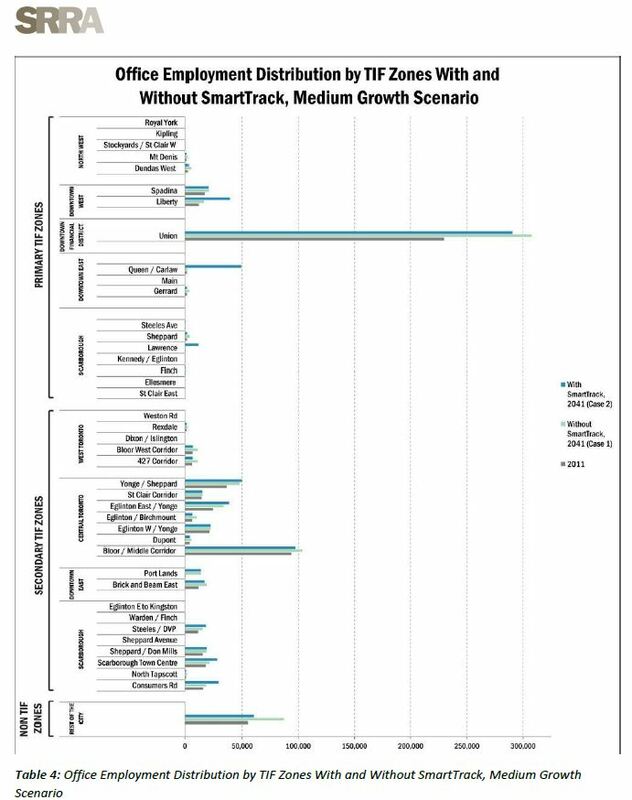 It is impossible to sort out which of many factors might be “SmartTrack” uplift as opposed to other factors. 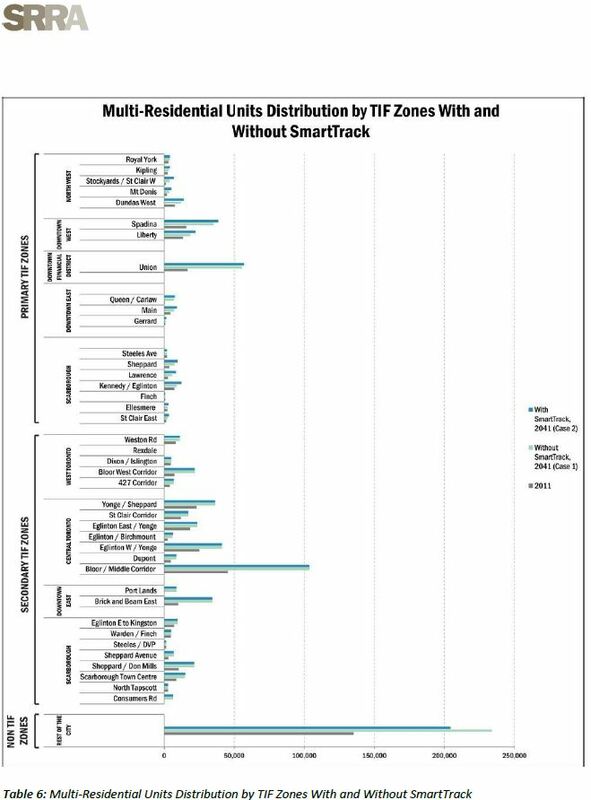 However, if you read some of the presentations from TIF advocates (including the SRRA report), you will see that they count “uplift” as if it could be uniquely quantified. This really only works for isolated, probably brownfield, projects where no other factor would be present. Applying this to a thriving, built up city is nonsense, but TIF advocates live in a fantasy world. I urge anyone, hoping that RER/SmartTrack addresses transit issues, to attend one of the Metrolinx information sessions listed below on Steve’s blog. I attended the Nov 7 meeting. It was clearly stated that RER is 15 minute service on GO lines requiring considerable track and electrification upgrades. Certainly converting single track to double track lines is a big improvement however they said serious service improvement can only come from upgrading signaling systems which are not even on the horizon, possibility starting in 2025. Metrolinx had no representative to answer SmartTrack questions but a City planner stood up and stated that SmartTrack was merely Go trains. I didn’t feel it appropriate to raise my favourite questions — what about Union Station and when are EMU’s scheduled. These will not happen in the lifetime of anyone reading this. Steve: Yes! The idea that ST was a major addition to network capacity was a fiction of the Tory election literature, but is not part of what will actually be implemented. Any estimates of ridership diversion depending on very frequent service are interesting theoretical works, but of value only in showing what we will not be getting. Chris said: I haven’t heard their city councilors share any concerns about their inconvenienced constituents. Which just means their councillors are unwilling to publicly admit that they might be (are probably) wrong; it doesn’t mean that people haven’t figured out they’re getting screwed over. I’ve thought this before, but I really think that a mayor and councillors who vote for expensive commitments with promises that the funding plans will just work – despite what experts say – should be forced to post a bond in case (when) it doesn’t. Like the fiasco with the M****rC**d Centre, where the city was forced to assume the debt they’d guaranteed, and then write down part of it – all of which was 100% foreseeable, and fully predicted. And it cost Grimsey (local chair sitter and consummate lickspittle) absolutely nothing at all. How can Tory and his cronies continue on when faced with facts like these? Are they utterly delusional? Or are they just hoping that the people will believe in perpetuity that Tory’s administration making “progress?” At least pyramid schemes pay interest! How long can the con go on? Facts, you expect a politician to be swayed by Facts. The article listed the GO stations serving SmartTrack as “Milliken, Agincourt, Kennedy, Main, Union, Bloor, Mount Dennis”. Should that list also include Scarborough? Steve: Scarborough Station is east of the junction between LSE and the Stouffville corridor. It is not clear whether there will be a “Scarborough” station on the Stouffville/ST line. There is no station at this location shown on the RER maps. Richard L said: Should that list also include Scarborough? Steve: Scarborough Station is east of the junction between LSE and the Stouffville corridor. It is not clear whether there will be a “Scarborough” station on the Stouffville/ST line. No, Scarborough GO Station is a LSE station, and it’s already very sub-standard. The single track for the Uxbridge subdivision only accesses one platform. The twinned Uxbridge track would go to the north, thus not allowing two-way service. A fourth mainline Kingston track on the south side would/will require demoing the existing station building. The more likely long-term solution is a grade separation, which would increase speeds for the Stouffville line, allow the existing fourth track to become a Kingston mainline through the station, and remove the need for a Danforth road closure. Either way, no Scarborough doesn’t get Smart Track.